From Maine to New Mexico, agencies are incorporating the principles of context sensitive solutions (CSS) to transform how they plan and develop transportation projects to better meet the needs of users. 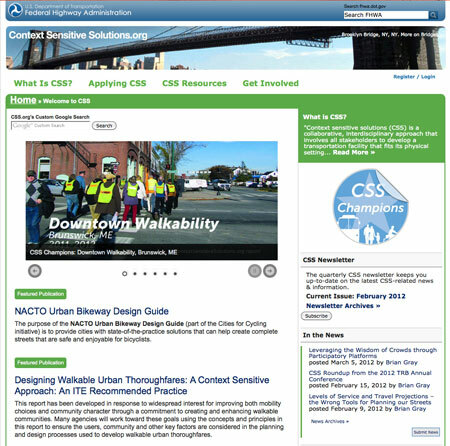 Visit the Federal Highway Administration (FHWA) CSS Web site (http://contextsensitivesolutions.org) to learn how CSS has enabled agencies to design urban thoroughfares that keep neighborhoods walkable, create safer streets that are enjoyable for cyclists and other users, improve rural highways in environmentally sensitive areas, and allow for diverse interests within a community to agree on the purpose, need, scope, and community context for transportation projects. For visitors to the site, it's all CSS, all the time. Whether you are new to CSS or an experienced practitioner, the recently redesigned site is the place to go for CSS news, research, publications, case studies, and much more. Strive towards a shared stakeholder vision to provide a basis for decisions. Demonstrate a comprehensive understanding of contexts. Foster continuing communication and collaboration to achieve consensus. Exercise flexibility and creativity to shape effective transportation solutions, while preserving and enhancing community and natural environments. Starting with "What Is CSS," the site offers resources for a diverse group of practitioners. Visitors new to CSS can learn about the history of CSS, its guiding principles, and the benefits of using the process. "Tools for Applying CSS" includes a more indepth discussion of the integration of CSS principles in the project development process and in the assessment and decisionmaking that occurs when designing a project. The "Resources" section covers State case studies, successful practices of State and local agencies, publications, and recordings and presentations from CSS Webinars. A primary feature of the site is the CSS Toolbox, which contains many significant CSS publications, "CSS in the News" and upcoming events, training information, statistics and quotes, a list of industry experts and links to industry resources, FHWA memorandums and other resources, and information on FHWA experts. Users can create their own customized Toolbox by downloading files from the site. Visitors can also join discussion groups or contribute content to the site. Updates on the upcoming CSS National Dialogues will also be available. This program will provide opportunities for CSS practitioners across the country to exchange best practices, ask questions, and raise awareness of the latest developments in CSS. FHWA is also exploring the development of an interdisciplinary CSS course with the University of Maryland School of Architecture, Planning, and Preservation. This course is tentatively scheduled to begin in fall 2012. Supplemented with speakers from FHWA, the course will feature a syllabus developed from CSS research and case studies in conjunction with the University's curriculum. Start exploring CSS by visiting http://contextsensitivesolutions.org. To subscribe to the quarterly CSS newsletter, see the "CSS Newsletter" information on the home page. For more information about CSS, contact Jon Obenberger at FHWA, 202-366-2221 (email: jon.obenberger@dot.gov).